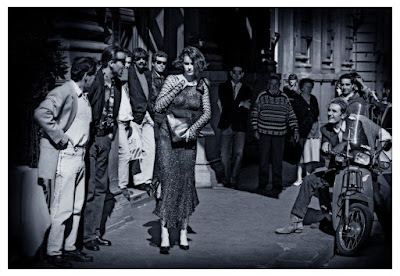 How can a woman in a semitransparent dress, passing on the streets of Florence, pass by unnoticed? Or should we question why a woman in a semitransparent dress is challenging? The above picture - inspired by Ruth Orkin’s 1951 photograph, ‘American girl in Italy’, reworks the underlying issues of female freedom and independency. Being foremost independent and possibly attractive stresses female power over men and the ability to challenge patriarchal behavior. The woman ‘out objects’ herself in claiming her ‘subjective freedom’. She, like He, plays this game in the face of gender difference, molding both men and women into objects. Challenging the other gender, even as we are controlled by a vision of being sexual bodies, is hitchhiking on a road where ‘the obvious will always be the driver, in a country of good reasons’, even when the road might be deceptive. Less obvious is the question of whether we have distorted intimacy into something we can rationally justify? Have we made a confused exchange between the inescapable faults ascribed to the virtues of the male and female body and the awareness that intimacy informs all the conceptual relationships of Life? Intimacy unties borders in which the other is disqualified - in a moral way. That this disqualification is unfounded might perplex us, but it will not make us doubt. When intimacy is appropriated into a web of the already related, the lurking suspicion is that once we have sexualised the body, will we also not find that we have destroyed intimacy? Read on: More ways in which images are not always quite what they seem are explored in the post immediately below, by Keith Tidman. Thank you for an observant post, Tessa. With regard to the reference to Keith, L’Osservatore Romano writes: “His [Max's] images seem immersed in a stage set ...” Which is just what I thought of this one. Yes indeed, this is a staged picture. Staged does not mean less real. The picture above is quite anthropological. There is a profound culture in how Florentine men approached women. Even if afterwards this picture becomes a fashion photo, the internal message of the picture is placed backwards to this masculine game becoming a male-female game. As a remake of 'American girl in Italy' made in the 1950's, Max's picture evolves the discourse to the 1990's, stated by a semi-transparent dress. In a certain way this gives a reason for the remake to make sense. We should question if we are capable to read images. Eventually, if we would see the above picture in a fashion magazine or a museum, would that change our interpretation? After all, an image is an image, pretending it to serve specific purposes distorts the vision of the image but that distortion is surely not into the picture itself. For every picture taken, reality had to be there. So the question is how we perceive the real. I think of 'Dali Atomicus' by Philippe Halsman of 1948. This picture might appear false while every element was into the shot of the picture. Staged, yes, but handing to us a world that is real. (And maybe today, more real than before when we adhere to ideas like quantum physics). Then we should question do we need proof? What is honest? Can a picture be proof? Is proof honest? Can reality be honestly proofed in a picture? The difficulty is to know if something can present what it is. Thus I have this strange idea, that probably staged or manipulated pictures would be more effective to provide a view on reality in f.e. newspapers nowadays, than often the actual journalistic snapshots. (Not underestimating the quality of many journalistic pictures). We can remain impassive in front of highly tragic images forgetting we are made of images ourselves; in an overload of images that surround us each day we forget that by profiting of images we are not only merchandising ourselves (if one would think we are reflected in every image indirectly), we have taken the image away from its original meaning. Which is to recognise ourselves and doubt our convictions, to see our own strangeness, to apprehend life is not banal, to imagine, not very philosophically sounding but though philosophically put: to love. This is about our own sensitivity. This means that indirectly every expectation put into a picture to reflect reality is deceptive, for we are deceptive to ourselves even when we might call that our honesty. This shows the difficulty to understand where the real and honest actually starts. ‘So Cheshire cats can smile. I did not know that,’ said Alice. ‘You don’t know much,’ said the Duchess.